Shenandoah Downs was located in Charles Town, about 75 miles from both Baltimore and Washington D.C. When Shenandoah Downs opened in 1959 it advertised a facility than could hold 15,000 fans, it featured a glass enclosed clubhouse, which included the Starlight Terrace Restaurant that seated 800.The track was a five eights mile dirt oval, which featured three and one half furlong sprints. At the time the grandstand was open air but was soon converted to an enclosed area. Parking was available for 3,500 cars and the stable area housed 600 horses. 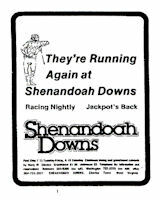 Shenandoah Downs was opened as a night time venue, the few thoroughbred tracks at the time that were running nights, had been converted from day racing. Along with close neighbor Charles Town Race Track, both tracks altered race dates throughout the year, it was rumored they shared the same mailbox. Why! would you build a racetrack across the street from another racetrack? Why! would you build a racetrack for Thoroughbreds that ran most races at three and one half furlongs? The answer to the question is that "Shenny" was never intended to feature thoroughbreds, it was built to be a Harness track but was never given permission by the West Virginia racing commission to do so. Shenandoah was converted to accommodate the runners and peacefully co-existed with Charles Town race track for twenty years. The fact it started life as a harness track eventually led to it's demise. In the late seventies both tracks ended up with the same ownership and economics dictated that one had to go. Charles Town which had the larger racing surface won that race. It too had some survival issues and has been able to delay it's appointment with the wrecking ball when West Virginia legalized the use of VLT's (Video Lottery Terminals). Today it is thriving as the new hybred "Racino" combination race track and casino. Although it is gone the memory of those three and a half furlong plugs linger. Whether it was the price you were going to get because you knew that the higher price shipper from Maryland couldn't beat your horse out of the gate or catch it in the stretch or that your speed horse was going to pay a price it seemed somehow like stealing! Shenandoah also gave fans a full weekend of racing before Sunday racing was legalized, the track quite frequently ran day, night doubleheaders on Saturday's. The grandstand has been demolished, the track was used for training for a while, but that too has disappeared. At one point when Charles Town was being upgraded there was talk about re-opining Shenandoah Downs while the remodel was being done, but the condition of the facility at that time, didn't make it a viable option. If you look at the photo page you can see Shenandoah as it looks today, the track is pretty obscure, but you can make out where the barns use to be. I myself spent a little time there in summertime in the late sixties, when the horse in Maryland had their vacation in Delaware. It was a long haul from Norfolk, but those double headers made it worth while. I was there in 1968 when True North won the Tri State Futurity, but the one thing I remember most wasn't the racing. I remember on the ride soon after you crossed the West Virginia border there was this giant red arrow about 20 feet tall advertising a housing development. I don't suppose that that's still there. It seemed at the time that I was a regular at Shenandoah, but looking back I probably was there only a half dozen times.